Learn to control your paraglider with command and gas through basic maneuvers of acrobatics. Fly safer and driving your wings wherever you want. Expand your level of flight, as well as spend a fun weekend sharing with Ramón the course and experiences, our base of operations: CAT - BORNOS. The objective of this course is through a training with basic acrobatics maneuvers, to make the student able to learn to control the movements of the wing, and thus little by little to have the necessary control in each situation of possible risk, Both in flights with turbulent conditions or simply to raise the flight level by periodically training these tricks. 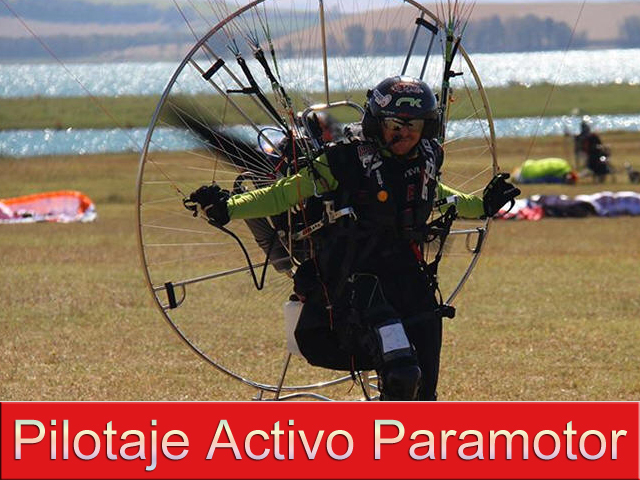 In the flight in paramotor, it is possible to help using the gas, both to control or stop an unwanted movement and to accompany in dynamic maneuvers accentuating the energy using the power of the engine. It is also important to specify what we call driven turns, since the torque, motor torque and propeller help or prevent spin depending on the side that is. In this course we will be able to experience the feeling of taking the sail to where we want avoiding to the maximum the skids, techniques that also serve for future slalom pilots. Among the maneuvers that we will train, we can highlight the wing overs, dolphins, augers and twist among others, the course is done on the water, specifically in the swamp of Bornos where the company Bornos active gives us the support of safety boats and lifts In addition to the classrooms for the theoretical and the visualization of the videos.